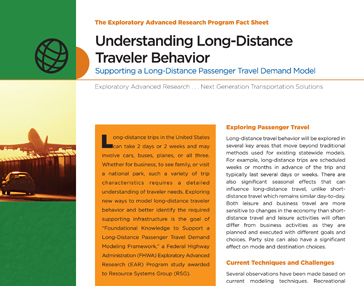 Long Distance Passenger Travel Demand Modeling Framework | Resource Systems Group, Inc.
RSG is leading a team of academics (from University of Texas at Austin, Arizona State University, Auburn University, and University of Leeds) to develop a framework for a long distance travel demand model that can be used to build a national model for the U.S. This framework will include exploration of advanced modeling methods for existing state-wide models, including model structure, trip purposes, market segmentation, synthetic populations, and model forms. The modeling framework will consider agent-based modeling of households, annual models including weekend and seasonal travel, alternative model structures, leisure and business travel and implementation challenges. The first phase of the project (1 year) will be to review the literature, design the framework and develop a work plan for the research phase (2 years). The research plan will include model estimation and data recommendations. The new national passenger forecasting model that will be possible based on this framework will allow federal, state, and regional planners to make more informed decisions about the policy and infrastructure investments they are considering.